People with asthma know just how serious and scary of a disease it is. It causes airways to narrow, makes it hard to breathe, and can potentially be life-threatening. There is currently no cure, but there are advanced treatments and medications that can help keep airways open so more air can pass through. However, the team at our dental office in San Diego knows that both asthma and the medicines used to treat it may lead to cavities. How Are Asthma and Cavities Linked? The main symptom of asthma is difficulty breathing since the narrowing of airways restricts oxygen flow. 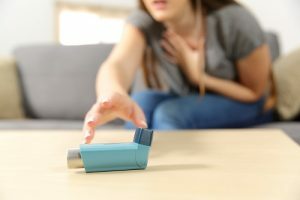 Because of this, many people with asthma tend to be mouth breathers, simply because it’s a little easier to get the air they need. While this involuntary response allows asthma patients to catch their breath, it can result in dry mouth. Some of the most common asthma medications also can cause dry mouth as a side effect. When a mouth is too dry, there’s not enough saliva to keep the mouth moist, help neutralize acids, or wash away harmful bacteria. This means that all of the acid and bacteria left behind can wear away tooth enamel and cause tooth decay and cavities. There are multiple things you can do to help minimize your risk of dry mouth and cavities caused by asthma or asthma treatment. Drink More Water. Choosing to drink water instead of juice or soda helps rehydrate your mouth and will help eliminate the dangerous bacteria and damaging acids. Make sure you’re drinking plenty of water throughout the day, every day. Rinse Your Mouth. A quick rinse with water or fluoride mouthwash after taking asthma medication or using an inhaler will wash away some of the drying ingredients so they’re not left lingering around for a long time. The sooner you can rinse, the better. Brush Well, Brush Often. One of the best ways you can protect your teeth against dry mouth and cavities is to brush your teeth every day. A good brushing for two minutes in the morning and again at night removes food particles that may still be lingering around and washes away bacteria that have built up throughout the day. It’s also important to floss once a day to get the parts of your teeth a toothbrush just can’t reach. See Your Dentist in San Diego Regularly. While it’s important for everyone to go to the dentist at least twice a year, it’s particularly important for those with asthma. These visits help us thoroughly remove any plaque buildup and allow for early diagnosis and treatment of any issues that may have popped up. Your care team at our San Diego dental office is dedicated to keeping you healthy and encourages you to talk to us about your health history and medication use so we can get an accurate picture of your overall health and understand what may be affecting your oral health. If you have any questions or if there’s anything we can do to help keep you relaxed during visits, just let us know. We serve the San Diego community and are conveniently located between Scripps Ranch and Mira Mesa.